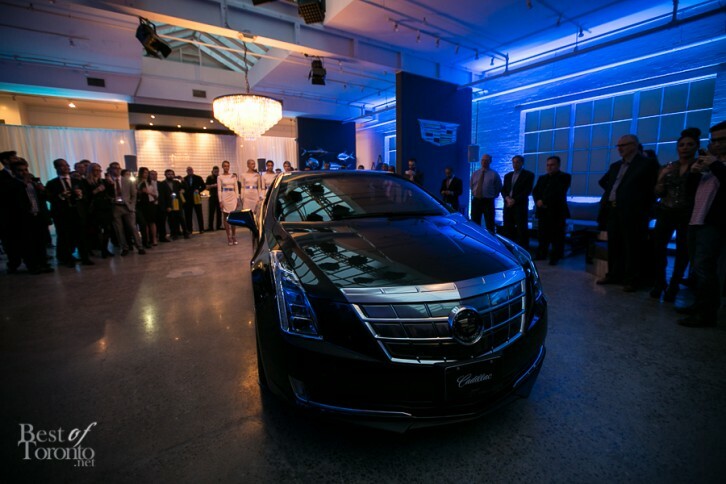 I was lucky to be invited to the reveal of Cadillac’s latest entry into “luxury, efficiency and innovation” in Canada with their hybrid gas and electric sport coupe, the first-ever Cadillac ELR. Taking place at one of King East’s top furniture studios, UpCountry, everything about the launch event was top notch. And that’s always expected from premier event planners, Candice & Alison. In many ways they even outdid themselves since the last Cadillac reveal back in October for the CTS at Shangri-La. Guests at this exclusive launch were treated to a sushi bar, Rodney’s Oyster’s served on an ice bar, and catering by the Food Dudes. Extra additions included pocket circles with your choice of designs made on the spot by Philip Sparks (Philip Sparks bow ties were at the Cadillac CTS reveal), and a build-your-own perfume booth with Aromachology. 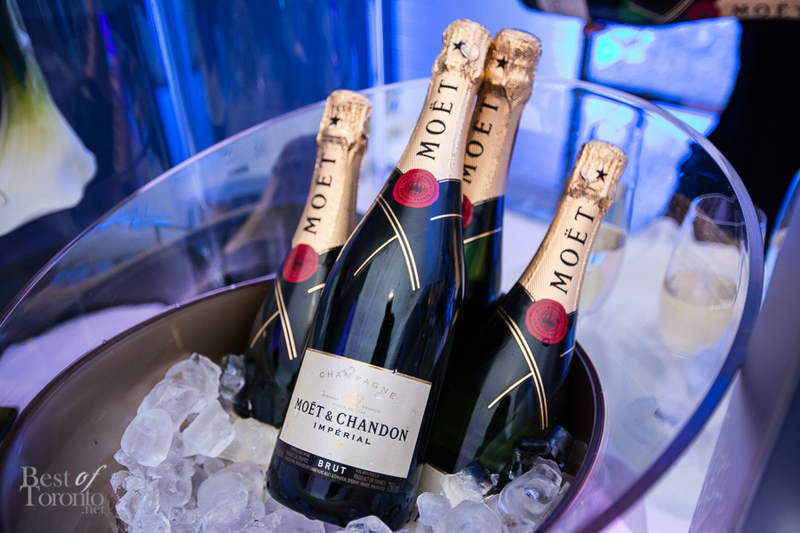 There was an impressive selection of premium libations including Cadillac-themed cocktails and champagne (Moët & Chandon Brut). A few guests got their photo ops in the driver’s seat (and elsewhere) and also signed up for an opportunity to test drive the Cadillac ELR. And you can’t talk about the ELR without mentioning Tesla Motors since they both share the same territory although with different approaches. The ELR coming from GM’s luxury brand, Cadillac (with learnings from the Chevrolet Volt), which has sportier underpinnings in this coupe powered by a hybrid of gas & electric compared to the all-electric Tesla Model S sport sedan (check out our coverage of Tesla’s launch at Yorkdale in November 2012). Where the Cadillac ELR shines is in extended range with the use of both motors having the ability to ride in full-electric drive mode and supported by the “efficientrange-extending (gasoline) generator”. Figures from GM say the total distance can exceed 300 miles (480 km) so daily commutes will use zero gasoline. The technology ante is upped here in this Caddy with controls and notifications programmed online as well as on your smartphone including personalized charging schedules and energy efficiency reports. Read Car and Driver’s review of the Cadillac ELR here. I enjoyed and recommend watching the documentary “Revenge of the Electric Car” which relevantly talks about the brief history of the electric vehicle including GM’s Chevrolet Volt, Tesla’s cars and the Nissan Leaf. If you haven’t seen it, check out the trailer for “Revenge of the Electric Car” here. This interesting documentary is also available for viewing on Netflix. While the Cadillac ELR may be priced beyond most starting at $78,250, it is another important milestone to reducing the world’s carbon footprint. I look forward to seeing more electric-based vehicles on the road as well as the infrastructure to support the growing demand. Check out the Cadillac ELR video “Poolside” starring actor Neal McDonough which has caused quite a stir but Cadillac addressed it here in adage.com. Interesting video nonetheless.